From these photos I can already tell that Sinful Colors – See You Soon will probably not be very similar to the other two. Are the others very similar though? Let’s see when they are closer together. 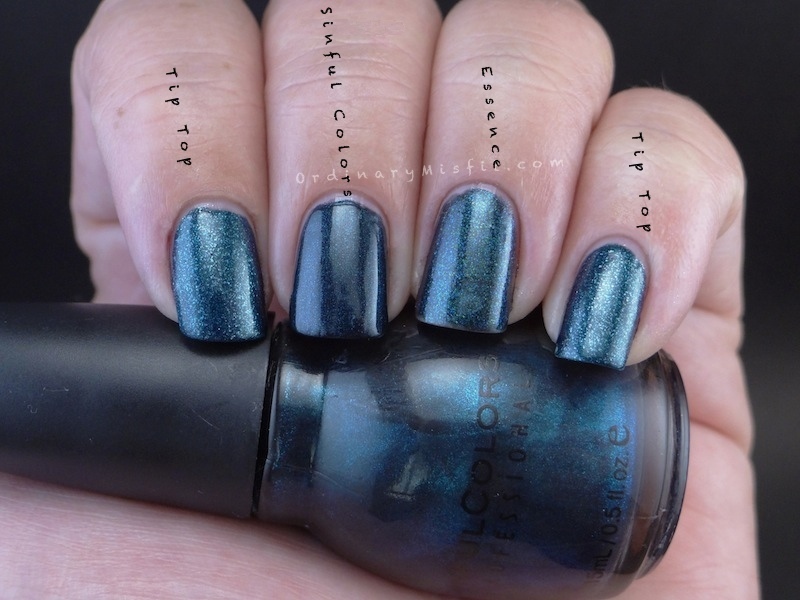 Here it is pretty obvious that Sinful Colors – See You Soon is not similar to the others. It has the same blackened base but perhaps a bit darker and also with less / smaller glitter. 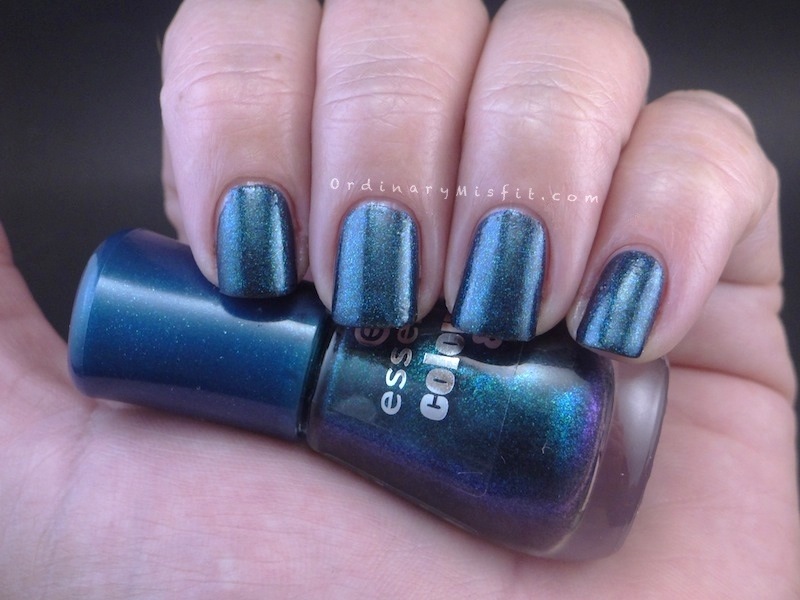 Essence – Miss Universe and Tip Top – Stormy Sky seem much more similar. Miss Universe seems to have a bit more green glitter than Stormy Sky and Stormy Sky seems to have a bit more silver glitter than Miss Universe. Honestly, this is much more evident on the photo than it is in real life. In real life they look almost identical. Both the Essence and the Tip Top look like they dry to a texture but they don’t. I think it is just how the glitter looks. Sinful Colors dried super smooth and shiny. In my opinion, If you have one you don’t NEED the other. The Sinful Colors – See You Soon is very pretty. Especially if you like the darker colours but want something that isn’t black. The Tip Top is from the Nail Addict range and is available at selected Foschini store, the essence is available at Dischem or Clicks and the Sinful Colors is available at Clicks or selected Ackermans. What do you think? Do you have any other polishes you would like for me to compare? You’re welcome to check out my swatches or my collection and let me know if you want any polishes compared. I find the essence stands to almost always be empty. It’s so disappointing. Sinful seems to be ok this side but I actually had to pick this one up from Ackermans at the time. Hahah Always win when you can save money for other polishes right!? Glad I could help out! I hope I’ll explain this properly. Miss universe looks like a finer version of Stormy sky. Other than that love this post! Thanks V. Yes that is a good way to explain it but I must admit, on my nail they looked exactly alike. Do one with pink! Loved this! Imka recently posted…It’s OFFICIALLY Spring! Oh great idea! Any specific pinks? Yay! Glad I could help 😛 I also like these comparison posts actually. I just wish more people would ask for them hahaha. Thanks T!!! I was also wondering how the formula of sinful compares to the Essence/Catrice ranges. 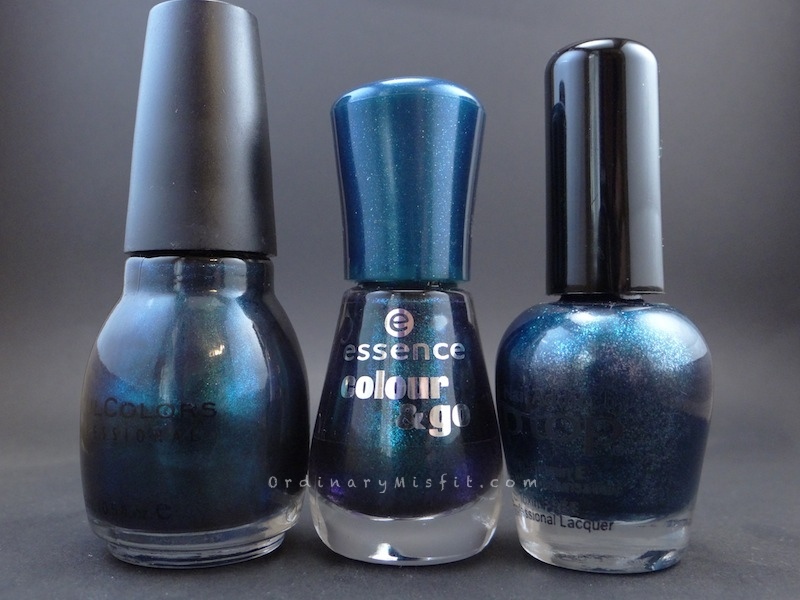 I find both Essence and Catrice too hard to work with – first they seem quite thick, and second they take too long to dry and I always end up dinging my nails. Is Sinful any better? Yes the addict range is quite different and tend to have a few more exciting shades. I find sinful colors to be quite a bit better than essence and catrice. Even though I don’t have the same issues you do, I do find Sinful to be a nicer formula and longer lasting. If you do have any problems with not drying fast enough I can highly recommend the Essence express dry drops. They really work very well. Quick dry top coat is also the business if you ask me. Let me know if you want more info about these. Also, let me know if you don’t find the list. Once I am home again I can find it for you if you haven’t. I too love comparison posts so thank you! Yikes, and now I see that on your page on animal testing you have listed Sinful as being cruelty free – so I need to investigate that too. I may have got it wrong! That information was unfortunately from before they were bought out. Their holding company currently does not have a policy of anti-animal testing. The whole cruelty free is so hard to manoeuvre because these holding companies are actually the culprits. I do however still support Sinful Colors in the hope that they have stuck to their original policies within their company even though the holding company, clearly, does not. Cinderella and Mint Apple are 2 very gorgeous colours that I have not seen anything close to. Good choices.